DOES YOUR SKIN LOOK UNEVEN, OR ROUGH FROM PREVIOUS SCARRING? Acne/facial scarring is a difficult condition to remedy. We understand it's a highly emotional condition. Patients suffer quietly believing there is no hope or treatment. Fortunately, there are successful treatment options available to you. Traditional dermabrasion is the gold standard for delivering smooth skin texture. It is ideal for correcting acne scarring, “ice pick scars”, and moderate to severe skin imperfections. Many people attempt to battle unsightly scarring with OTC creams and “micro” dermabrasion with minimal signs of improvement. Dr. Diamantis understands the psychological trauma poor texture may cause; and he is happy to help. Fortunately, there’s a variety of procedures proven to smooth the skin. Here you will find photographs of several patients who sought Dr. “D’s” help. Scarring of the facial skin is a very emotionally difficult problem. 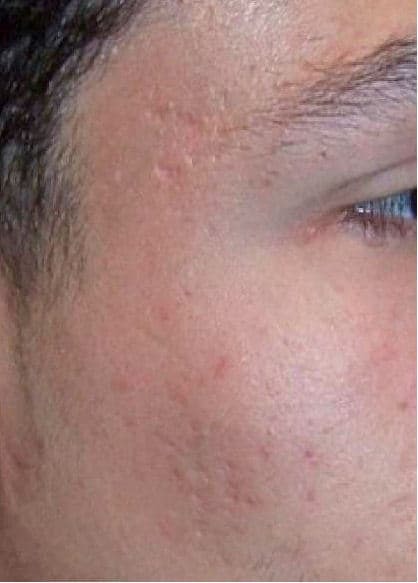 Acne or Pox scarring is a permanent disfigurement that affects men and women. There is no easy fix to this problem. Dr. Diamantis will evaluate you and develop a multi prong approach to help erase the deep scars. Dermabrasion is the gold standard for softening the scars and blending the skin. Dermabrasion is an office procedure performed with mild sedation. A special diamond fraise is used to even out the skin and diminish the scars. This procedure requires 3-4 days of recovery. Dermabrasion is the ultimate technique to smooth and remove moderate to severe facial scars. Dr. Diamantis routinely utilizes dermabrasion to improve active scarring, hypertrophic scars and keloids. The results are permanent and very impressive. Do not confuse Dermabrasion with microdermabrasion.
" Banker, marathon runner and dressage trainer"
"They say your whole life shows in your face, and for me ... I didn't like it." Jennifer loves the outdoors. Whether she's walking her dog or jumping fences with her horse, she lives for the thrill of it all, and doesn't look back. There are some things she wishes to change, like having better skin. Her skin problem has been a life long struggle. Jen almost gave up on having nice smooth skin. Thankfully, she sought out treatment, and it changed her life. 1. DERMABRASION-to permanently smooth the look of deep acne scars. She will require multiple dermabrasion..
2. SUBSICSION/ EXCISION OF ACNE SCARS- to remove resistant acne/ ice pick scars. 3. PIXEL PERFECT®-to blend and improve the appearance of her skin tone and texture. 4. LOCATION-AAAHC accredited Lakewood office ­Cleveland Cosmetic Surgery private surgical suite. 5. ANESTHESIA OPTIONS-local anesthesia with IV sedation vs. local anesthesia. The recovery period is 5 days. 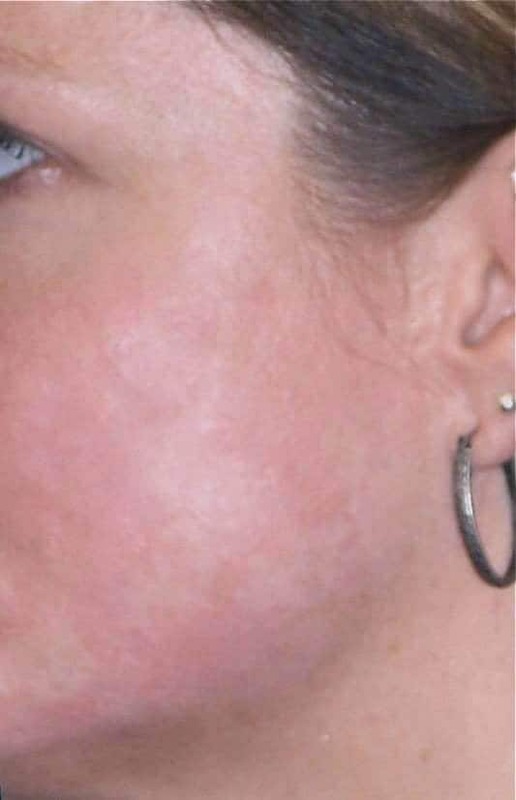 Jen presented to Cleveland Cosmetic Surgery with severe anxiety and embarrassment concerning her skin. It's been a lifelong issue that's affected her well-being. Jen cannot cover the scars with make-up. Dr. Diamantis is very sensitive to this problem and thus developed a Dermabrasion protocol to soften the scarring and give Jen back her life. Jen is very pleased with the improvement of her skin. Most importantly she feels more confident with her skin texture. Dr. Diamantis performed Dermabrasion, excision and subsicion of the deep icepick scars. "Real estate agent, husband, and soccer player"
"For the first time, my skin is smooth." From training for soccer matches to running a successful real estate agency, Miguel doesn't always make time for skin care. 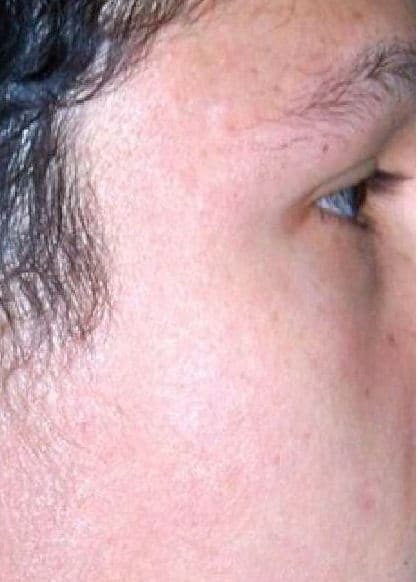 His severe acne scarring is troublesome and warrants specialized medical attention. Dr.'D' recommended traditional dermabrasion. Today, Miguel is delighted with the way he looks. He's so happy that he opted to forgo a second dermabrasion session. 1. DERMABRASION-to permanently smooth the look of deep acne scars. Miguel will require multiple dermabrasion sessions. 2. CLENZIDERM® ACNE TREATMENT- products to manage acne outbreaks and maintain the appearance of his skin. 3. LOCATION-AAAHC accredited Lakewood office ­Cleveland Cosmetic Surgery private surgical suite. 4. ANESTHESIA OPTIONS-local anesthesia with IV sedation vs. local anesthesia. 5. Recovery period is 3 - 5 days. Miguel is concerned with the acne scarring more notably around the cheek and temple area. As a teenager he had severe acne that permanently scarred his cheeks and temples. Dr. Diamantis evaluated Miguel and developed a protocol that included dermabrasion and topical skin lotions. Miguel underwent one treatment of dermabrasion in the office. He's very pleased with the results. Dr. Diamantis suggested a second session to soften any residual scarring. Incidentally, don't confuse microdermabrasion with this treatment. They are mutually exclusive! Simply put, dermabrasion performed at Cleveland Cosmetic Surgery is more effective.